This isn’t your typical brunch hot spot with the eggs, poached, scrambled or fried – eggs are mixed with sprinkles of herbs and spices, delicious and rich meats, greens, reds, and cheese, cheese, cheese! Kazbah makes you fall in love with the vibrant colours, protein filled dishes, sauces and abundance of flavours and textures. There’s the original at Balmain, but it was tempting to give this one a go with no queues and a more laid back atmosphere. A pork belly skewer for brunch is definitely an overindulgence; but it was crispy with that thick layer of crackling sitting on top. 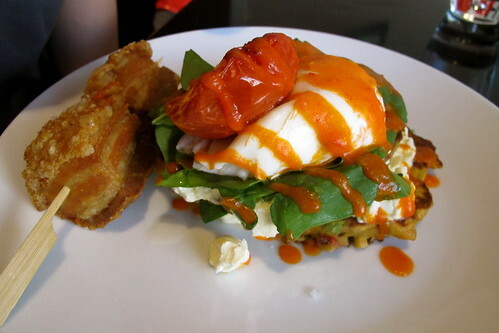 The poached egg ooozed over the stack of cheese, baby spinach sitting on top of a crispy chickpea fritter. 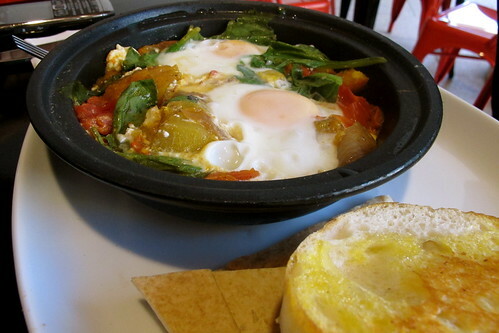 My other foodie choose a vegetarian tagine, a dish orientating from Morocco. All of the ingredients such as pumpkin, spinach, capsicum, tomatoes, onions, eggs and feta cheese are thrown into a glazed pot, the tagine, and slowly cooked. The eggs were a little overdone, but still a delicious veggie delight. 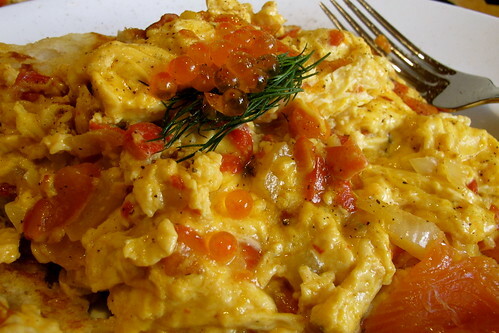 Of the three, I would favourite mine the most; a chakchouka of eggs involves a vibrant mix of peppers, tomatoes, onions, eggs of course, and plentiful of herbs and spices of paprika and chilli. 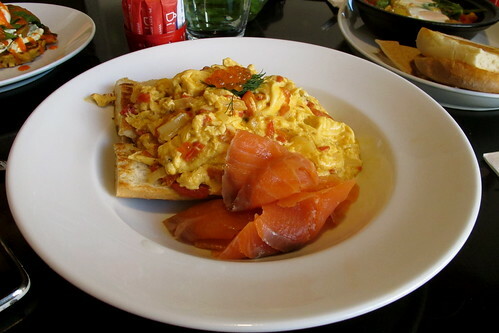 Served on toasted turkish bread with slices of fresh smoked salmon, and topped with roe and dill. The eggs were light and fluffy and packed so much flavour to shake any hangover. Amazing brunches with a twist.